Just in case someone is thinking of going to the 2016 Rotary Convention in Seoul. Link to a Personal Invitation from Seoul Host Committee Chair SangKoo Yun. Link to Last Chance for Registration Savings. Link to a district message about Friendship Exchanges - two incoming and one outgoing. Link to The Rotary Club of the Bay of Islands - Andrew Thompson Rotary Challenge. Link to a message from Frank Leadley about his autobiography. Link to Rotary Weekly -11 December 2015. Link to Rotary Down Under 579 - December 2015. At our meeting last week we welcomed Sally Macauley, Far North District Councillor, Kaikohe resident and a good friend of Rotary. 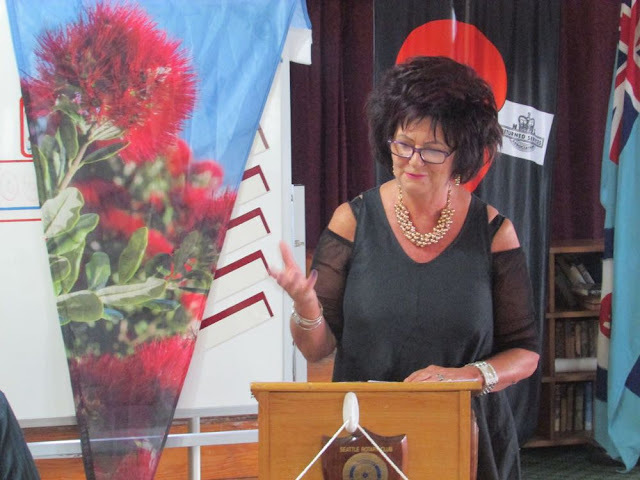 Sally told Rotarians she had arranged to put up Christmas flags attached to power poles on the main street of Kaikohe which is also State Highway 12. But the New Zealand Transport Agency had refused permission, saying the flags could lead to the power poles being blown over. After intervention from the Mayor and CEO of Far North District Council NZTA said the flags could go up provided Sally got an assessment from wind engineer costing $5000. This is despite the fact the power poles are made of steel, have been up for decades and Sally has attached flags to them in past years without incident. However, following further discussions, NZTA allowed Sally to defer the wind assessment until next year, provided she takes out liability insurance against anyone gets hit by a falling power pole. Sally has done this, so Kaikohe will not miss out on its Christmas flags. Sally also spoke of her plans to refresh the Kaikohe Skatepark. Sally initiated the Skatepark in 2000 when she was chair of the Kaikohe Community Board and raised the money to get it built. But 15 years later it looks a little tired and requires changes to meet the needs of today's skateboarders. Sally has talked with users, worked with former skateboarding champ Dave Crabb and has plans drawn up. Sally has also raised $60,000 but needs another $50,000. Sally has obtained consents from the council and had hoped work would start before Christmas. This won't happen. But the job has to be done in summer while the weather is good. However, this is the time when the skatepark is at its busiest, so the needs of users will have to be managed. Sally also spoke of a proposal to build a an indoor pool in Kaikohe. A working group was set up to plan and fundraise for the project which could cost up to $3 million. Sally says the money can be found it could be built in three years. The facility would be in addition to the existing outdoor pool at Northland College which is due to open for the summer on 20 December.